There is a crowd of people in front of Brad Marchand‘s stall in the Boston Bruins locker room. From the perimeter, you’re able to see the top of the Bruins cap that the 5’ 9″ winger is sporting, just minutes after his team’s 3-2 win over the Los Angeles Kings on Monday afternoon. Though at times, you can see him through the gaps of credentialed media members, looking for a soundbite for their columns. “I do, I get real lucky,” said Marchand, on whether he considers luck to be a factor in his recent play. As of late, Marchand has been the Bruins’ most dominant offensive contributor, tallying six goals and one assist in his last four games. He added two in Monday’s win, just 24 hours after he scored two in a shootout loss against the Chicago Blackhawks. 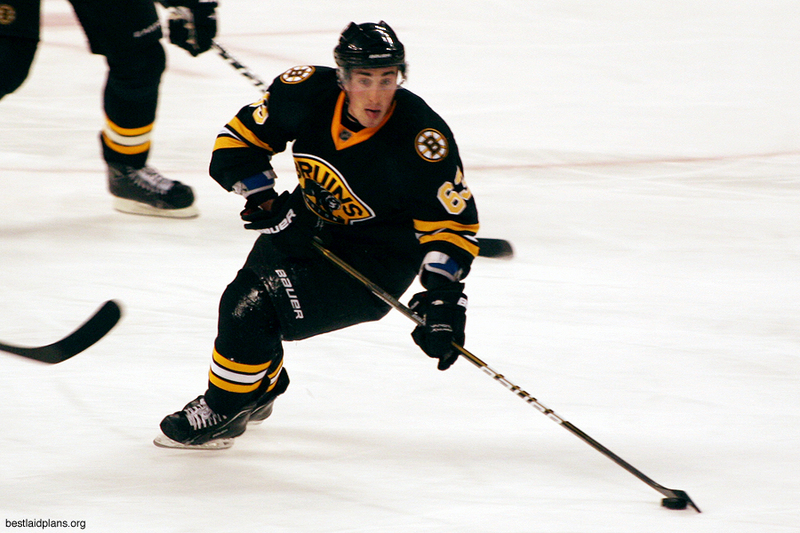 It was the first time Marchand had back-to-back multi-goal games in his five NHL seasons. Marchand’s streak is also a departure from how he started the season–flat, a bit hesitant, and off the scoresheet. But it’s not luck at all. Instead, Marchand is playing as confident as he has ever been. And for teams playing against the Bruins, that’s a scary thing. The great speed was demonstrated at multiple junctures during the game. Marchand beat out icing calls on three separate occasions, but no play was more impressive than his shorthanded goal where he beat out, literally, four Kings players to get his own rebound past Jonathan Quick. Marchand’s fourth shorthanded goal is tops in the league. His second goal of the night, 16th of the season, now leads all Bruins. All of this from a guy who scored one goal in his first 14 games. Confidence goes a long way for a player who thrives on it but couldn’t find the spark at the start of the season. Bergeron had the assists on both Marchand goals. The pair, along with linemate Reilly Smith are beginning to inch up to their “1a-1b” status alongside the Bruins’ true first line of Milan Lucic, David Krejci, and Jarome Iginla. It’s the first time you could say that all year. Marchand has also been shooting more. In the past four games of his streak, Marchand fired 15 shots on net. In the first 14 games, Marchand was held without a shot five times. Good things happen when you shoot the puck. Of course, it’d be unsupported to claim that Marchand is going to win the NHL scoring title. It might even be preposterous to assume that Marchand leads the Bruins in scoring at the end of the year. But whatever it this is, Marchand’s streak is something that the winger badly needed to get going this season. You’re seeing what can happen when the winger is on top of his game–almost anything. With the confidence he’s building, he’s becoming more dangerous to play against and opponents top defensive pairs will certainly take notice. As for Marchand, it’s still just one game at a time. Follow Mike on Twitter for more Bruins updates, news, and commentary.